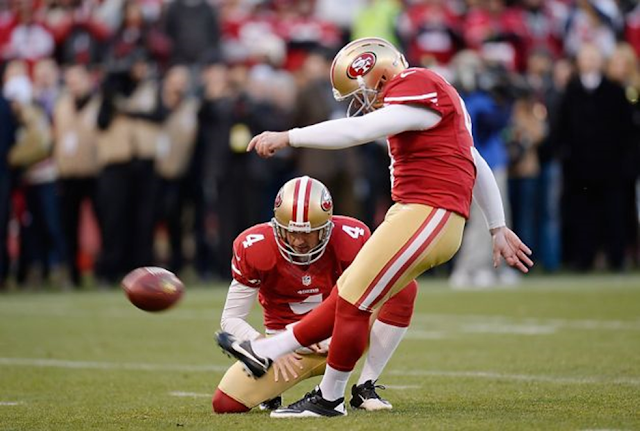 Phil Dawson, placekicker, San Francisco. For his 56-yard game-winner at Arizona, inside of two minutes, to go up by three and apparently win the game, and then, after the Cards tied it up with 29 seconds left, for his 40-yarder right down the middle as time expired for a 23-20 Niners win. For the second time since Week Four, Phil Dawson missed a kick last week. But the 49ers kicker also hit at the right time, with a game-winning 40-yarder pushing his team to the playoffs. So for the second time this month, Dawson was named NFC special teams player of the week, after also winning the award in Week 14. Dawson has hit 32-of-36 field goal attempts and all 42 of his extra points for the 49ers this year. That gives them much more confidence going into the postseason than a year ago, when they were bringing in competition for David Akers because of his struggles. Sports Illustrated: Ted Ginn Jr. "one of the more underrated additions any team made"
A season like this one should make folks appreciate just how remarkable those couple 16-0 -- or even 15-1 or 14-2 -- runs are. No team will finish this year better than 13-3, with only Denver and Seattle in striking distance of that mark. There may not have been top-to-bottom parity in the sense that all 32 teams stayed in the playoff race for 17 weeks, but this has been as unpredictable a year on a game-to-game basis as any in recent memory. That the Broncos are No. 1 here speaks to the general uncertainty surrounding the NFL as the playoffs approach. Yes, Denver is 12-3 and likely headed for home-field throughout the AFC playoffs, but this is a flawed team -- even more so with Von Miller done and Wes Welker still out. A brief moment of appreciation here for the Panthers' offseason pickup of Ted Ginn Jr., which has proven to be one of the more underrated additions any team made. Ginn helped put Carolina in position to beat New Orleans with a critical catch-and-run in the game's final minute. There was a play early in Sunday's loss to Arizona where Russell Wilson escaped trouble in the pocket but then threw a horribly ill-advised jump ball into traffic. It was a very un-Wilson-like decision ... and an omen for what was a very un-Wilson-like performance. The 49ers needed some defensive heroics to slide past a four-win Atlanta team on Monday night, so feel free to debate this spot. Here's the thing, though: San Francisco has lost just twice since Sept. 23, and that was a top-three defense putting the icing on the cake versus the Falcons. The last time that the Colts defense held back-to-back teams under 300 yards before doing so in Weeks 15 and 16 was way back in Weeks 3-4. The Colts are 4-0 in those contests. Rarely has Tom Brady been as ... well ... nonessential as he was in the Patriots' 41-7 rout of Baltimore on Sunday. Brady was solid -- 172 yards passing, one touchdown -- but it was the run game and opportunistic defense that really shouldered the load. Heck, Brady couldn't even get anyone to high-five him after a late touchdown. Too bad for the Cardinals that the NFL playoff participants are not chosen by committee, like March Madness or the new college football final four. Arizona would be an absolute lock for an at-large bid. It had been three years since Matt Cassel had a performance like the one he delivered against Philadelphia in Week 15, so maybe we just chalk that whole game up as an anomaly. That's the only time since September the Eagles have allowed more than 21 points. Am I crazy or do the Bengals look like a legitimate threat to win the Super Bowl all of a sudden? They stunk up the joint at Pittsburgh in Week 15, but they're 4-1 in their last five, and Andy Dalton has 10 touchdowns to one INT in December. Between them, Ryan Mathews and Danny Woodhead now have combined for 2,263 yards from scrimmage. That's akin to what Mathews and Mike Tolbert used to churn out together. Or what LaDainian Tomlinson did by himself back in his heyday. At what point should the Saints be concerned about Drew Brees and the offense? Brees was totally out of whack -- again -- for most of Sunday's loss, and the offense has scored 17 or less in four of its last five (with a 31-point showing in the lone home game during that stretch). Three straight losses at home for the Chiefs, who now will open the playoffs on the road. And maybe that's not the worst thing in the world, given that they're 7-0 outside the friendly Kansas City confines. The Dolphins have allowed a staggering 58 sacks, which matches the league-high number allowed by Arizona last season (and Miami has a game left). That is also the most given up since Oakland coughed up 72 in 2008. It's shocking Ryan Tannehill was not hurt before Sunday. This franchise did not really bat an eye when Mike Wallace left town, and Antonio Brown is the reason why. With one week left in the regular season, Brown is No. 3 in the league in both receptions (101) and yards receiving (1,412). The thought of this team having the No. 1 or No. 2 pick in the draft (plus another first-rounder) should scare the rest of the league. St. Louis is not far off from being a true playoff contender. The Ravens might not mind Justin Tucker's made-FG streak coming to an end in the midst of a blowout loss, as it did Sunday. At least that will keep them from feeling like Tucker's due to shank one should he come up with the playoffs on the line. Here's the list of teams that have allowed more points than the Bears this season: Minnesota and Washington. That's it. Those teams have a combined seven victories, so Chicago's 8-7 record is a borderline Christmas miracle. The Packers obviously would have loved to have Aaron Rodgers in the lineup the past few weeks. But playing him for half a season, then resting him until the division's on the line might keep him around as the starting QB for about three decades. The Bills will not be satisfied -- nor should they be -- with their 6-9 record so far. That said, the teams they've beaten hints at the ability here: Carolina, a sweep of the Dolphins, the Jets, Jaguars and Ravens. All but Jacksonville have a shot to get into the postseason. New York hung two touchdowns on the board en route to a 23-20 overtime win in Detroit. One by cornerback Will Hill, who had never scored in the NFL (nor at college at Florida); the other by WR Jerrel Jernigan, who entered Sunday with more fumbles in his NFL career (two) than TDs (zero). Rex Ryan reportedly told his players last week that he was going to be fired at the end of the year, and they responded with a win in a must-have game. This week, Rex will threaten to take their Christmas presents away if they don't get another victory. Remember when the Titans were 3-1 and looked like they would challenge the Colts in the AFC South? No? Me neither. Pretty fitting loss for the Falcons on Monday night, given that they have the talent to compete and simply have not been able to put it all together often in 2013. There's little doubt that 2014 will be better. Turns out a team can only take the whole "play for pride" thing so far. The Vikings hit their breaking point in Week 16, with a humiliating loss to a Cincinnati team in the hunt for the playoffs. Jim Schwartz turning to shout at the home fans Sunday will get a lot of play as Schwartz's tenure likely ends. The more telling issue within that moment is that Schwartz apparently did not have enough confidence in Matthew Stafford to let the high-priced QB turn it loose with the division -- and Schwartz's job -- on the line. More or less copy and paste the Vikings' write-up here. The Jaguars deserve credit for rebounding from that 0-8 start to win four of their next five. Back-to-back home losses to the Bills and Titans, however, will take a little shine off. The offense has been under the microscope for much of the season, but the Browns have been let down by a few disappointing performances on defense. Neither the linebackers nor the defensive backs have been good enough to help stop the bleeding. The needle has drifted back to "Probably" from "Maybe not" on the Greg Schiano Dismissal Scale. There hasn't been much to get excited about in Tampa Bay over the past couple of weeks. Not sure I understand the seemingly growing urge to can Dennis Allen. The Raiders did not try to hide the fact that 2013 would be a season focused on getting their cap and roster in order so that things would be better in '14 and beyond. Who exactly is the No. 2 option in the passing game behind Pierre Garcon? The injured Jordan Reed had a case, as does 34-year-old Santana Moss. But Washington might want to spend a little energy finding some help there. The Astros finished the season on a 15-game losing streak, so at least the Texans can't match that. Are they printing Teddy Bridgewater jerseys down there yet? The San Francisco 49ers head into the offseason having to deal with several contract situations. Aside from considering Colin Kaepernick's new contract, they have several key veterans coming up for new contracts. Two of those include wide receiver Anquan Boldin and kicker Phil Dawson. Friday evening, 49ers general manager Trent Baalke said on his weekly radio segment that the team had already had some brief discussions with the two free agents. He said they'd start really working on it after the season, and hopefully get something done. Boldin and Dawson have both been critical additions this offseason. Boldin currently has 70 receptions for 958 yards, and has been a critical weapon in Colin Kaepernick's arsenal. 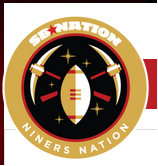 Before Michael Crabtree returned to the field, Boldin was Kap's safety blanket. Vernon Davis was the deep threat, but Boldin was the guy Kap looked to for some critical gains. Since Crabtree's return, Boldin has continued to play an important role, and Crabtree has opened him up further at times. Dawson is having one of the best seasons of his career. He has converted 27 of 30 field goal attempts, and set the 49ers franchise record for consecutive field goals converted. After spending a season wondering if David Akers would actually connect on any field goals, Dawson has been a breath of fresh air. As we head into the office, I'm not really sure what to expect with contracts for either player. Boldin wanted a new deal in Baltimore, but was traded because they couldn't agree to terms. The 49ers need wide receiver options, with Michael Crabtree and Quinton Patton the only receivers of note signed beyond this year. They also have Chuck Jacobs on the practice squad. Boldin would be very helpful in building the wide receiver corps for next year, but do they have room to work with him on a deal? The 49ers signed Dawson to a one-year deal. Dawson is 38, but some of the best kickers seem to be able to last longer in the NFL. I'm not overly concerned about age in this regard. But again, do they try and find a kicker in the draft or undrafted free agency? Dawson has shown how valuable a solid kicker is, so that will have to be considered. 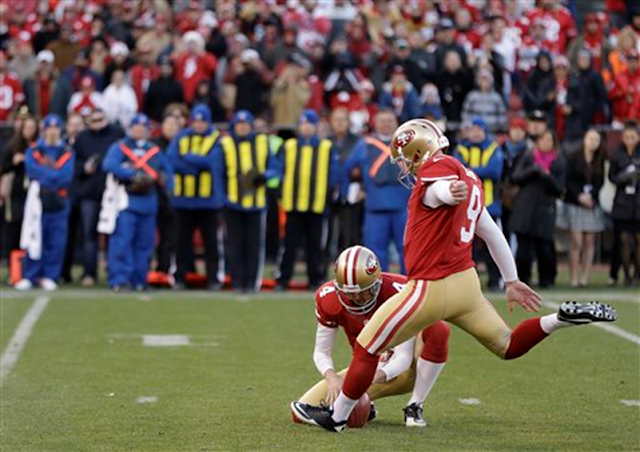 San Francisco 49ers head coach Jim Harbaugh isn’t taking the consistency of kicker Phil Dawson for granted. After suffering the struggles of David Akers a season ago, Harbaugh is thrilled with the job Dawson has done for the team this season. However, Dawson was only signed to a one-year deal this season. It led Harbaugh to make a public plea for Dawson to stick with the team beyond this season. 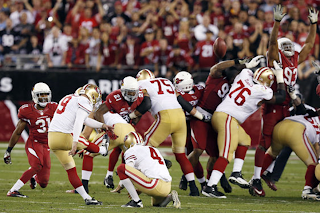 While the 49ers made it to the Super Bowl last season, the kicking situation was a problem that could have kept them from winning the NFC. Akers made just 29 of his 42 field goals for the 49ers in the regular season last year and the team brought in Bily Cundiff to compete for the job. Akers did convert all three attempts in the Super Bowl and was 4 for 5 in the playoffs, but the 49ers signed Dawson this season with the hope it would fix the issues of a season ago. Dawson has been a model of consistency for San Francisco this year. He’s converted 27 of 30 field goals on the year and is a perfect 38 for 38 on point after attempts. “Twenty-four straight field goals — he has been a top-notch guy on the team from the day he got here, a real football player in every sense of the word. That doesn’t always get affixed to kickers and punters, but Phil is that kind of teammate. . . . A-plus-plus. Very happy with Phil,” Harbaugh said. 49ers head coach Jim Harbaugh met with the media, and had plenty to talk about following the 49ers 33-14 win over the Bucs. 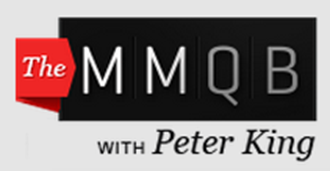 We have a transcript for your viewing pleasure. Have you asked K Phil Dawson to stay beyond this season, yet? "No, let me do that right now. Phil, stay beyond this season, please. No, I've been remiss asking him to do that. Let me officially ask him to stay beyond this season." That is a legitimate question. "Absolutely. I'm glad you brought it up. 24 straight field goals and he has just been a top-notch guy too on the team from the day he got here. Just a real guy's guy. Real football player in every sense of the word, which that always doesn't get affixed to kickers and punters, but Phil is that kind of a teammate. It's about the team. It's about accomplishing the mission and the goal of the team and him doing his job within that. That's the way I truly believe the way he looks at it. So, it's been A-plus-plus. Very happy with Phil. Nothing not to be happy with him about. Just so good on the field, off the field, in the locker, in the community, etc." Bowman was saying the other day that he sees Phil Dawson here when he doesn't have to be here. Have you observed some of those moments where he's here--? "He's got a perfect attendance in the offseason. I've not seen a lot of kickers and punters have perfect attendance before. But yeah, he's committed. He's made a great sacrifice too. His family's not here and they come and visit. He talks about them all the time. He's a great role model too for all of us, just how much he loves his wife, how much he loves his kids, how much he talks about them. Just the way he does so many things right. It's great for everybody to see that." How much does he influence your decision making? He's become so reliable and so automatic on these field goals, as you drive guys drive downfield, I'm sure it shapes play-calling and your decisions. How has it affected your job during games? "It does. It's shaped it in a positive way. You feel you know you have the option and the high probability that he's going to make the kicks." So, a long-term deal coming up? Jim Harbaugh had some unusually lively and good-natured exchanges with reporters during his news conference today, especially when placekicker Phil Dawson’s name came up. 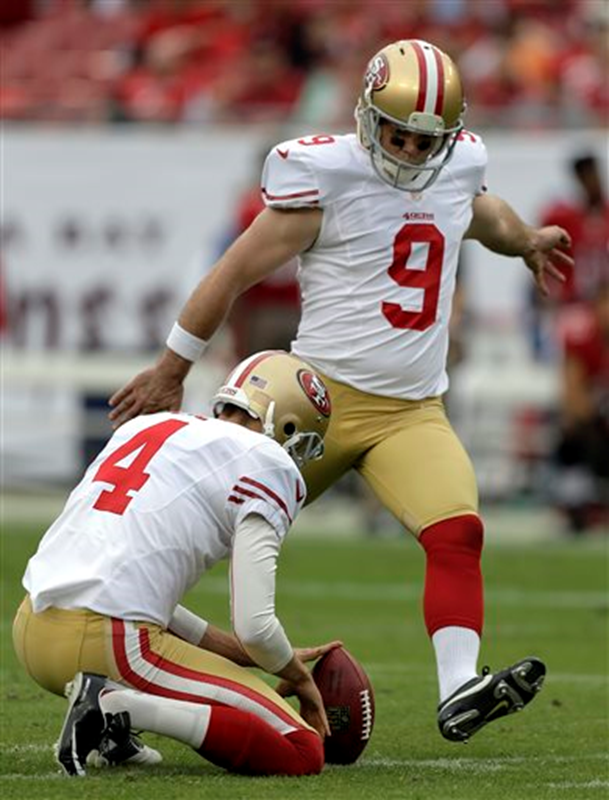 Dawson, of course, has become Mr. Automatic for the 49ers — he stretched his ongoing franchise record to 24 consecutive field goals with four more Sunday against Tampa Bay. He also made four in last week’s win over the Seahawks, and Dawson now is 27-of-30 on the season (including one free-kick miss from 71 yards). So when Harbaugh was asked if he had “asked Dawson to stay beyond this season yet,” he couldn’t resist complying — right there on the spot and with a touch of sarcasm, naturally. Once Harbaugh was done raving about Dawson, and it took a while, the same reporter then asked if a “long-term deal was coming. “Pay the man,” Harbaugh said, smiling. 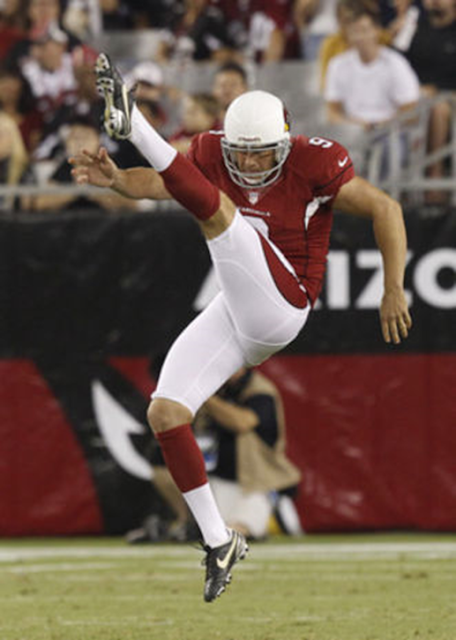 TEMPE, Ariz. – Dave Zastudil may not have the best leg or the longest kicks in the NFL, but when it comes to helping his team flip the field, there are few punters as good. 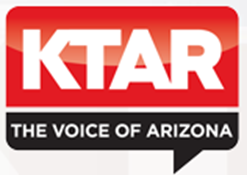 In the Arizona Cardinals' game Sunday against St. Louis, Zastudil landed three of his four punts inside the 20-yard line, including one that was downed at the 1. The fourth punt was initially thought to be downed at the 1 as well, but it was ruled a touchback. Thanks to Zastudil, Arizona’s opponents have started a league-high 33 drives inside the 20 after punts, according to ESPN Stats & Information. And that’s not good news for opponents. The Cards have the best defense in the league against drives that started inside the 20 off punts, allowing .55 points on those drives, fourth-best in the NFL. On average, Zastudil's punts inside the 20 have pinned opponents at their own 10-yard line and Arizona has not allowed a first down or touchdown on 51.5 percent of those drives. Thanks to Zastudil, Arizona’s defense is working with a large field and has been able to quash offenses quickly, with opponents having to punt 60.6 percent of the time. The defense should be showering Zastudil with gifts the way quarterbacks do with their offensive linemen. But this isn’t an anomaly. Last season, Zastudil set the NFL record for punts inside the 20 with 46. After Sunday, he’s tied for the league lead in that category with 31, alongside Kansas City’s Dustin Colquitt. Yet, in the NFL’s annual popularity contest, Zastudil’s achievements seem to be forgotten. In the most recent update on fan voting for the Pro Bowl, Zastudil wasn’t in the top 10 despite being among the 10 best in net punting average. However, he’s not completely being ignored: ESPN Stats & Info named him an honorable-mention punter this week for his performance against the Rams. Punter Dave Zastudil was one of several Cardinals players to visit Phoenix Children's Hospital Tuesday. PHOENIX -- The Arizona Cardinals took a timeout from preparing for Sunday's game against Tennessee Titans to spend time with kids at Phoenix Children's Hospital Tuesday. They gave away teddy bears during their "Teddy Bear Express" event. Back-up quarterback Drew Stanton was glad to help out. "I think especially now, being a father, and having a child, and trying to empathize with those parents in that situation, to be able to see a change in mood or a smile on a child's face when they're going through a tough time can really turn things around for that day and hopefully turn things in the right direction," said Stanton. Kicker Jay Feely, quarterback Ryan Lindley and center Lyle Sendlein were also among the Cardinals players who were there to help out. Cardinals cheerleaders were there as well, along with a 180-pound dog named Barney, who climbed on to beds with kids and let them pet him. Punter Dave Zastudil said the visit was rewarding for him. "It means a lot, especially around the holidays," Zastudil said. "These kids have been through a lot, have suffered, and most of them will continue to suffer for a little while. If we can come in here and put a smile on their face and make them forget the pain that they're going through, it makes you feel real good." This is the third straight year that Zastudil has made a holiday season trip to PCH. 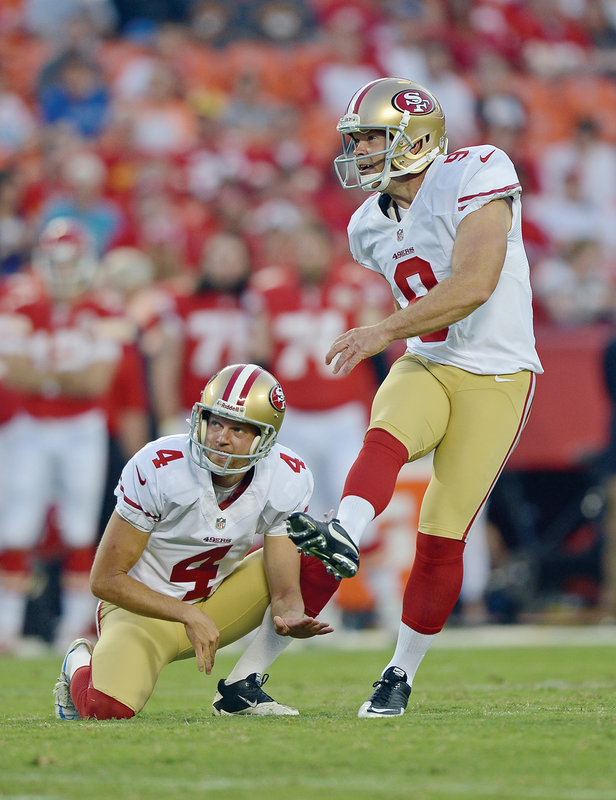 The 49ers were worried they were a kicker away from a championship team last year, and made a move to upgrade by signing Phil Dawson this offseason. The move has paid off, as he’s been nearly perfect. Dawson was named NFC special teams player of the week for his four-field goal performance in a win over the Seahawks. The last one was the decider, a 22-yarder with 26 seconds left. But he’s hit 20 straight field goals, setting a 49ers franchise record. With that kind of accuracy, they’re probably not going to need to bring kickers in for insurance in the postseason, like last year when David Akers was shaky. His father is a graphics designer. His mother works in customer service. The kid's no genetic freak, hardly bred for football greatness. He's just another kid with a dream, as improbable as the next. 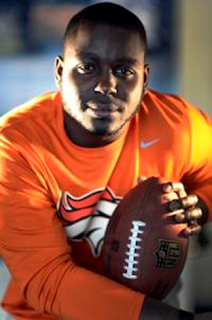 Eight-year-old Montee Ball doesn't know it's improbable, though. He doesn't know that Wentzville, Mo., is hardly prime football recruiting territory, or to play a sport at its highest level requires as much talent as it does determination. He doesn't know that a decade and a half later, he'll be paired with arguably the greatest quarterback of a generation, a man who might as well have been raised on another planet, or that their unlikely partnership might help him climb out of the struggles of a tough rookie year. He just knows he's going to play in the NFL. When Ball was in second grade, his teacher asked him what he wanted to be when he grew up. His answer came fast and sure: Football player. The NFL. "She was like, 'That's good, but think of something else you want to do, because the percentage is extremely low,' " Ball said. "But ... my dad always told me, if you have a backup plan, you've already failed." Ball hasn't needed that backup plan. It didn't matter that he couldn't play running back until he was 12 and he was finally under the weight limit required to touch the ball. It didn't matter that when he showed up to Timberland High School the summer before his freshman year, he was just a big back with potential, and that it took his coach, Craig Collins, another two years to realize Ball was a major college talent. It didn't matter that when he went to Wisconsin for college, he was third on the Badgers' depth chart, then still a backup as a sophomore. It didn't matter, because Ball was going to play in the NFL. By his junior year, Ball was a human highlight reel. He set NCAA record after NCAA record, most notably scoring 39 touchdowns as a junior to tie Barry Sanders for the most ever in a single season. Ball was the littlest big man on a campus known for producing cornfed lineman, eventually going in the second round to the Broncos — his favorite team as a child — in the 2013 NFL draft. But the fairy tale ends there, or perhaps it breaks for intermission. Ball's rookie season — until last Sunday — has been marred by fumbles and time on the bench. But, after rushing for 117 yards against the Kansas City Chiefs, the Ball the Broncos staked their second-round pick on seems to be surfacing. 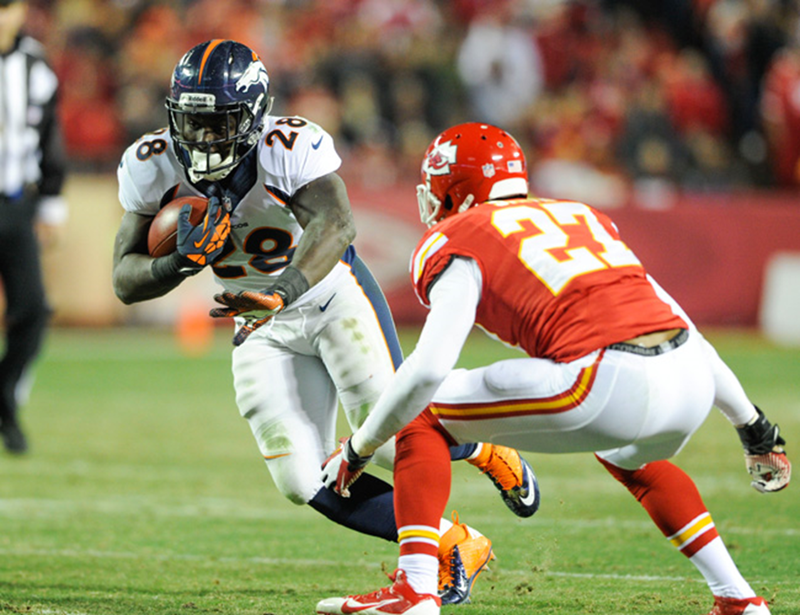 "Montee has been thrown into the fire as a rookie," Manning said. "He's certainly made some mistakes, like all rookies do, all players do. I'm still waiting for somebody to break my NFL record for interceptions as a rookie. Got to be a 16-game starter to do it, though." On paper, it's an unlikely pairing, Manning and Ball, but in reality, these are two of the most single-minded, goal-oriented players on the Broncos. Since the start of training camp, Manning has pulled Ball aside at practices to offer suggestions. He's helped slowed down the game for him, Ball said, although the rookie still struggles to stay on the wavelength of a four-time MVP. "I'm trying to catch up to how he sees the game, but as a running back," Ball said. "Obviously it's different as a quarterback. All I can say is he's really helped me take every play for what it is." Even now, Manning and the Broncos are still learning exactly what kind of player Ball can be. At Wisconsin, he rarely caught passes, but turns out, he's a better receiver than the Broncos imagined. He rarely had to block in college, but when asked to do it, he's exceeded expectations too. Most important, he's putting his mistakes behind him. "I think it's just kind of unwrapping the whole gift of what he can do," running backs coach Eric Studesville said. For a player whose name dots the NCAA record books, the past has somehow become irrelevant. This is a new world, light years from that far-out St. Louis suburb and the comfort of Madison. Ball isn't dwelling on it, though. After all, he didn't tell that teacher he wanted to be a college star. He told her NFL, and here he is, that improbable goal unfolding in front of him. After spending the first 14 seasons of his career in Cleveland, 49ers placekicker Phil Dawson had to adjust to some new surroundings this season. "I've just been trying each and every day to continue to get better," Dawson said, "and settle in a little more." That appears to be going quite well. Dawson had the best game of what's been a brilliant debut season in Sunday's 19-17 win over Seattle, setting a franchise record and drilling four field goals, including a 22-yard game-winner with 26 seconds left. With his third field goal - a 52-yarder in the second quarter - he broke Joe Nedney's franchise record for consecutive successful field-goal attempts (18). During his streak of 20 straight made kicks, Dawson has field goals of 53, 55 and 52 yards. He's made 23 of 26 attempts this season with misses from 48, 53 and 71 yards. "I try not to think about" the streak, Dawson said. "I try to treat every kick the same. You have to have a bad memory. Unfortunately, I have a really good memory, so I can remember my last miss." Quarterback Peyton Manning and running back Montee Ball are up for weekly honors after their performances in the Broncos' 35-28 win over the Chiefs on Sunday. ENGLEWOOD, Colo. -- The Broncos not only nabbed sole possession of first place in the AFC West in their 35-28 win over the Chiefs on Sunday – they also picked up several nominations for player of the week honors. Quarterback Peyton Manning and running back Montee Ball were announced as nominees for the FedEx Air & Ground NFL Players of the Week on Tuesday for their respective performances against the Chiefs. And for Ball, who posted the best performance of his young NFL career with 117 yards on 13 carries, the showing also meant a nomination for the Pepsi NEXT Rookie of the Week award. It’s the second time that Ball has been nominated as Pepsi NEXT Rookie of the Week – he also earned a nomination for his two rushing touchdown performance in the Broncos’ 27-17 win over the Chiefs in Week 11 – but the nomination for FedEx Ground NFL Player of the Week marked a first in Ball’s career. In setting a career high for rushing yards and posted an average of 9.0 yards per carry, Ball broke off a key 45-yard run late in the third quarter with the Broncos pinned at their own 5-yard line, helping set up Denver’s final touchdown of the game. Meanwhile, Manning is no stranger to FedEx Air NFL Player of the Week honors. This is the sixth time this season that the quarterback has been nominated for the award, and he was named FedEx Air NFL Player of the Week for his performances in the Broncos’ wins over the Ravens and Raiders in Week 1 and Week 3. On Sunday against the Chiefs, he was once again instrumental in leading the Broncos to victory, completing 22 of 35 passes for 403 yards and throwing five touchdown passes – helping wide receiver Eric Decker set a Broncos franchise record with four touchdown receptions. After the game, Decker credited Manning with making the performance possible. “It was easier, I guess, just because of the balls (Manning) throws,” Decker said. Manning underlined the importance of the win for the Broncos. To cast your votes for Manning and Ball for the FedEx Air & Ground NFL Players of the Week, click here (http://www.nfl.com/voting/players-air-and-ground/2013/reg/13) – and remember that you can also support Ball by clicking here (http://www.nfl.com/voting/rookies/2013/REG/13) to vote for him as Pepsi NEXT Rookie of the Week.